Here is a breakdown of the three things I decided to commit to over the last couples months that have caused the transformation. Always note, you won’t always see immediate action when you make changes on the surface. Sometimes, it takes awhile for those moves you’ve done to catch up and cause the change you want. Every day, all four of us take bold action that moved us closer to our dreams, goals and vision. You see most people have a list of things they want to achieve, and those tend to be mundane, but do not create the spark of change. When you decided no matter what each day one of your tasks is going to be bold and outlandish, it changes your mind frame. Bold action can be reaching out to Elon Musk to pitch him your ideas about Hyperloop. Or another bold action is emailing every boutique in a fifty-mile radius inquiring about getting your product in their location. Your bold action removes you from your comfort zone. It brings the action to the staleness that has been surrounding. 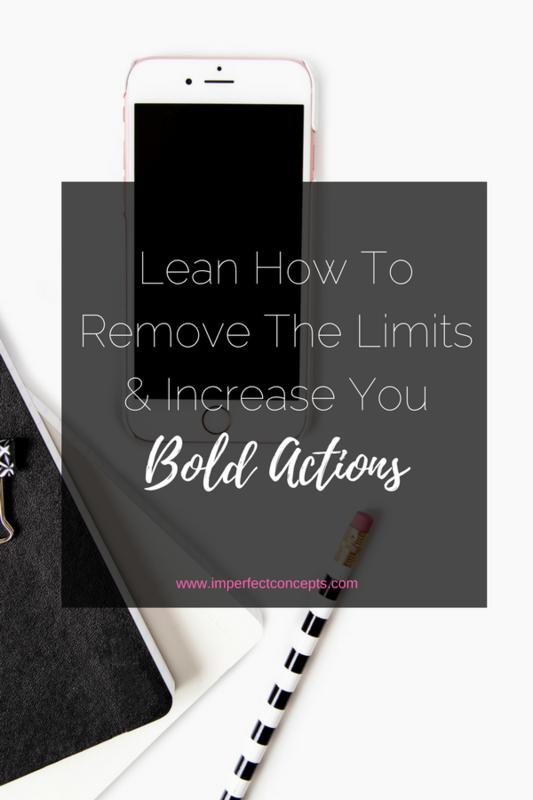 See that bold, outlandish move has now shown you that you can remove the limits off of yourself and who you are. When you set goals in your mind, you have only ONE way to achieve that particular task at hand. Your mind is stuck on that specific how option not allowing yourself to move forward. When doesn’t happen that way or on your time scale your mind shifts to the negative. Every week, I sit down to write how I can make x amount of money. Coming up with the craziest ways to achieve my goals. Not just limiting them to selling a digital product or a coaching call. In the last couple years, I have read about people receiving money in pizza boxes that were delivery. Money can come to you anyway long as you open your mind to the possibilities that God has. Two months ago my mother found $40 on the ground while doing her morning walk. You can achieve anything you put your mind to long as you remove the limits of the how. This is one of the biggest parts of this. You see after awhile affirmations are just phrases, goals get bored, and we forget to do what we said we would do. Having three others keeping me accountable asking me what was my bold action of the day or what have I done to move myself further keeps me going. When you select your accountability partner, you tend to select someone who is okay in their comfort zone just like you. That’s a huge is at hand. You want someone who is going to question you and make sure to say I don’t care if you only have three hours left in the day what are you going to do. This is not as simple as it seems, it can be extremely hard when trying to correct the shift in your life and business. It is about being active and intentional participant in the areas you want to change.